Londoners have clearly had enough. As Mayor Sadiq Khan’s police force clearly can’t (or is instructed not to?) 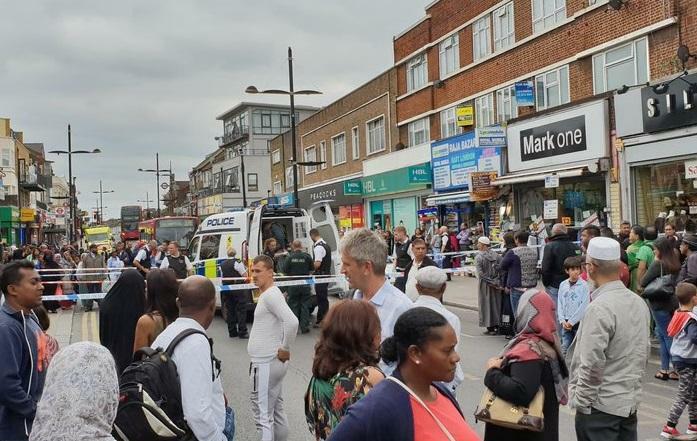 cope with the ever-growing violence in the UK capital (London overtook New York for number of murders earlier this year), innocents bystanders took it upon themselves to disarm a 16-year-old armed with a huge blade who had just stabbed a man in broad daylight in Green Street, Newham. The events come only two days after a 30-person youth brawl and subsequent mass stabbing in London which left several children ‘disembowelled’ (see related coverage). In the video, you can see how a group of brave Londoners gangs up on the youngster who had just stabbed someone. Three good Samaritan shoppers form a circle around him and try to break up the daytime fight. A fourth man, carrying two heavy shopping bags (the incident took place around 1pm local time) joins into the group, desperately trying to stop the fight on busy Green Street. Related coverage: <a href="https://thegoldwater.com/news/34159-UK-Children-Disembowelled-In-Another-London-Mass-Stabbing-Brawl-Of-30-Youths-Video">Children disembowelled in another London mass stabbing brawl (Video)</a>. Although police forces continue to urge the public not to get involved, it is becoming clear that the vigilante mob rule on the London streets has got many concerned as can be witnessed by the social media comments. I can't see any Londoners? Come on now, the guy with the grey hair in the middle…. Police took him into custody… for that performance, he would have to be Islamic. Sooo you ask? So he will go into the police lockup, then through the Muslim murderer's turnstile and straight out the back door…. standard procedure.. But if a Londoner… he will be tried in next 30 seconds sent to an Islamic prison and remains sent to the boneyard the following week…. You fools of the UK have voted in the rats who have done this to you… when are you going to root out the London Mayor and all the like-minded politicians and create a civil society again.. you have all lost the plot… just do it…. believe me, its worth it. The description of 'TEEN' seems to not be used to define age in the UK.